A note from the editors: We’re pleased to share an excerpt from Chapter 3 of Geri Coady's new book, Color Accessibility Workflows , available now from A Book Apart. Geri Coady is a color-obsessed designer and illustrator from St. John's, Newfoundland—the most easterly city in North America. She is the author of Pocket Guide to Colour Accessibility published by Five Simple Steps, and voted Net Magazine’s Designer of the Year in 2014. She regularly speaks at web conferences worldwide. Do the WCAG recommendations also apply when using mobile devices? The rendering and resolution would surely be affected with regard to colour contrast on many handheld devices. We know text size and spacing is already measured for mobile performance – Google even has its own tool. 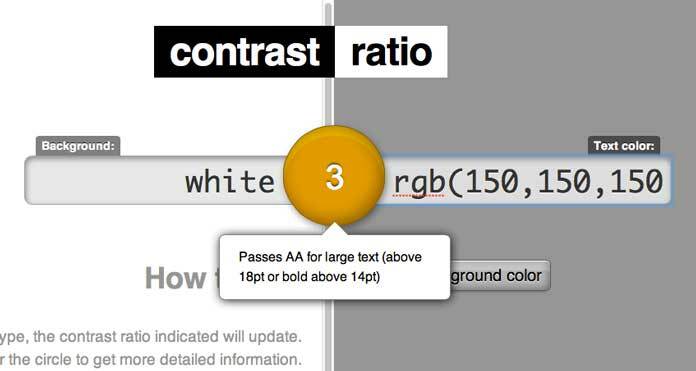 Perhaps Google will also stamp its foot down to help compliance with colour contrast? Geri, I think accessibility is a sadly neglected area in web development despite all the good work of the Web Accessibility Initiative; thanks for highlighting this issue. I would like to suggest another tool that I find very helpful – Paletton (http://paletton.com) offers a range of Vision Simulations. 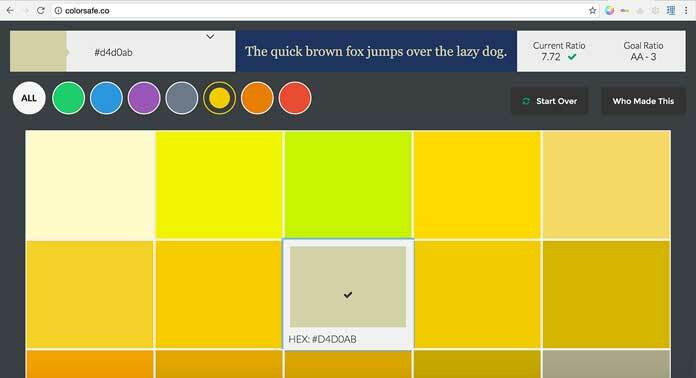 The Color Table – Color Combinations feature is also very helpful. Thank you Geri for the links and tools. Design accesibility is a topic we should all be mindful of and be enforcing. This is very useful. The correlation between text size and color is fairly evident but is there also any correlation or importance attached to font type? Great article – thanks for sharing your valuable collection of tools. However: My biggest problem regarding accessibility is often not the design process itself, but convincing the client from the advantages of it. A healthy young man without any disabilities is quite often more focused on his own perception of his website rather than anybody else’s. Has anybody useful thoughts about that? Great article, it definitely gave me something to think about. I’ve had great results using demographic surveys and Google analytics to create personas. I write the surveys in HTML and distribute them with Amazon Mechanical Turk. To Georg: I try to sell accessibility as a “best practice” and naturally build it in to whatever I am designing/developing. It should be part of your process rather than an add-on or afterthought. I also bring up the fact that we will all get older and most of us will encounter some difficulties using computers or devices in the future, be they visual impairments or motor/coordination issues. Making a responsive website is a form of accessibility and I’m sure your client wants to be able to use their site on a phone as well as a desktop. The purpose is to allow the greatest number of users to be able to access your site, regardless of ability or technology used. This is a good article and the tool references are great. Thank you. The point that appropriate contrast provides little interference with artistic range is spot on. Good work. I disagree with your suggestion to use the Level AAA contrast ratio. When WCAG 2.0 was created there was not enough appreciation of the impact of a condition called Photophobia. During our research on the Low Vision Task Force we were able to verify that this condition effects a large group of people with low vision. See, https://www.w3.org/TR/low-vision-needs/#light-sensitivity. This population includes many if not most people with blind spots like macular degeneration. This makes high contrast a two edged sword. Sufficient contrast is good for almost every person with low vision, but high contrast can produce too much light and cause pain to people with photophobia. I would suggest the 4.5:1 ratio in general. The ultimate solution would be to enable users to select colors. That doesn’t mean to provide a color picker on each page. All the developer needs to do is not get in the way. The biggest current barrier is sprites used in the background image. This prevents removing the background image and replacing background color with one that can support high contrast for people who need it and moderate contrast for people who experience pain from high contrast. Great research article. I’ve been looking for a tool like the contrast finder mentioned here. Great post. Thanks very much for the informaition. Thanks for writing this! I hadn’t previously known about the tool that Lea Verou built and I love it because it’s so straightforward and simple. nice post thank you for sharing . Great post. thank you for sharing . Definitely going to take a look into colour safety! A debt of gratitude is in order for a brilliant offer. Your article has importations your diligent work and experience you have in This field. Splendid understanding.I adore it. I’m in the same boat with trying to convince the client; they recently asked me, “Is it essential that our website be accessible? Who enforces it?” Sigh. The tips above are helpful; I’ll use those and maybe it will help. We are all getting older.